What a wonderful post! I was just recently talking to some teacher friends about the necessity of respect of our students. I believe that respect is where it should all start. Thanks for framing this post with the utmost respect to us teachers who need to hear this again and again, but particularly in May. Thank you for these beautiful messages friends! The most exciting part of writing, particularly when it’s from the heart, is knowing that teachers like each of you will take it into your respective places of learning and bring it to life with children. That’s where the real magic happens! Thank you for this post, Mary – and thank you as well to you, Jenn & Amy for creating such an incredible and relevant topic for this week’s chat. I am sorry I missed it on Thursday night. 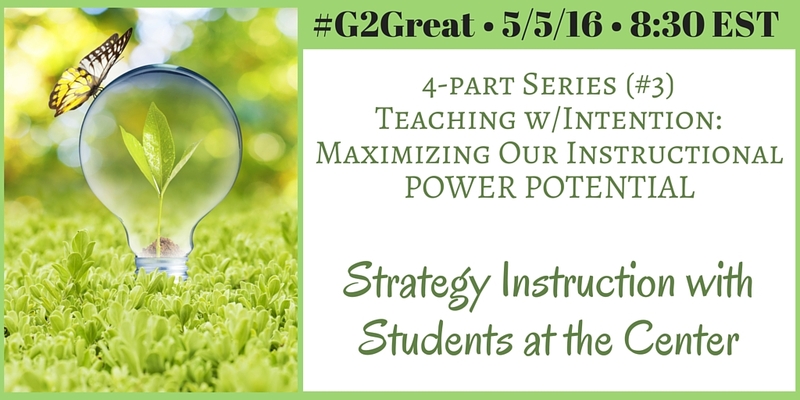 I am keeping a bookmark on this post and the accompanying Storify for what I know will be repeated visits as many of my teachers delve more into strategies this fall in a PD focused entirely around effective instruction and use of reading strategies. Love my #g2great family! Mary, I agree that May is the month for this post! We must think of the student every day, all the time. We work for them! “If our goal is respectful strategy work with a heart, pleasure and reading will be companions for every child. After all, isn’t that why we do this wonderful work?” Thank you for this encouraging post. At this time of year, when we teachers are tempted to focus on what we should have accomplished or what we didn’t do, we need to remember to focus on and celebrate those joyful readers in front of us!